Renovatio is an NGO that is working towards bringing about a positive change in the lives of people and improve them for a better tomorrow. The Week of Yoga is upon us. The whole world celebrated International Yoga day on June 21st and Renovatio intends to celebrate it too. Renovatio is celebrating this year's International Yoga Day with a 5-day workshop that will be conducted at Sindhu Bhawan adjacent to Eastern Sports Club, Wardhaman Nagar. This workshop is free for everyone who wants to celebrate the spirit of Yoga with the entire city. Timings of Reno Yoga are 6:00 AM to 7:30 AM. 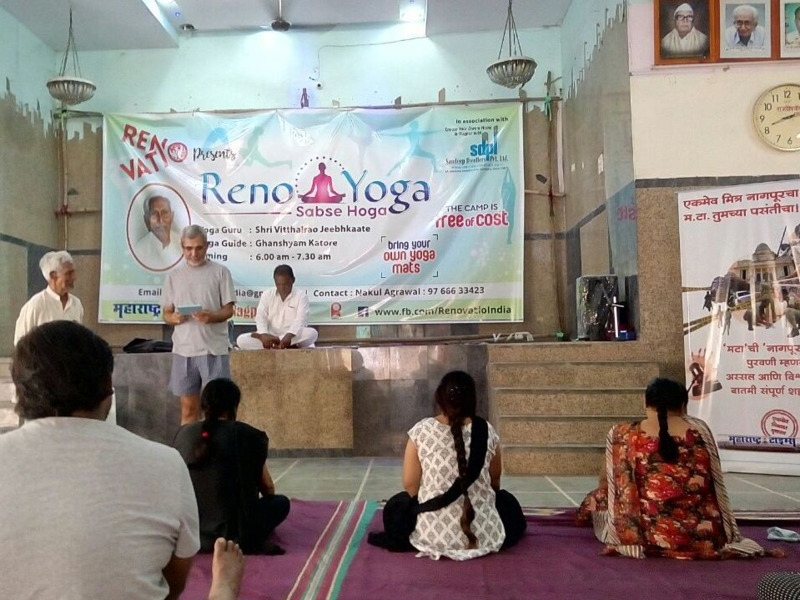 Glimpses from Day One of Reno Yoga session with renowned Yoga Guru Dr Vitthalrao Jeebhkate (88 years old). Dr Vitthalrao has conducted over 5000 Yoga camps till date and has authored over 40 books. The children from the city's orphanages also took an active part in the celebration of International Yoga Day. Bring your friends and family to make this experience more enjoyable and memorable. Renovatio welcomes you all.